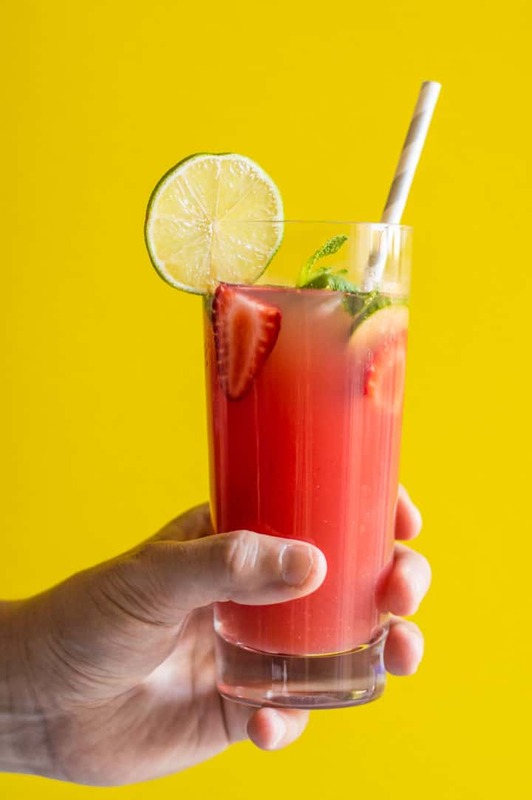 This naturally sweetened watermelon strawberry agua fresca is the perfect way to refresh yourself on a hot summer’s day! I hope your weekend will look a little something like that, too. Before I sail off into the sunset with a pint of microbrew, let’s talk about this perfect summer beverage. When I was still wee little Lisa, my favorite beverage in the world was fruit punch. In particular, Hawaiian Punch. More specifically, Hawaiian Punch in powdered form. I mixed 4 tablespoons of it to a cup of water. I used my fingers as a dipstick and stuck them straight into the jar of powdery red brilliance. That punch was the stuff that childhood dreams were made of. I downed that sugary mix as my tongue turned brighter red by the minute. Hawaiian Punch: the ambrosia for 5 year olds. My Hawaiian Punch days were over the day I learned to read nutrition facts labels. The sugar high was not worth the 50+ grams of sugar per can nor the constant visits to the scary dentist who liked to drill into my teeth. See what age does to your reasoning abilities? Now, I my bevvies of choice are naturally or mildly sweetened. (But I do have a higher tolerance for sugar when alcohol is involved. No surprise there.) 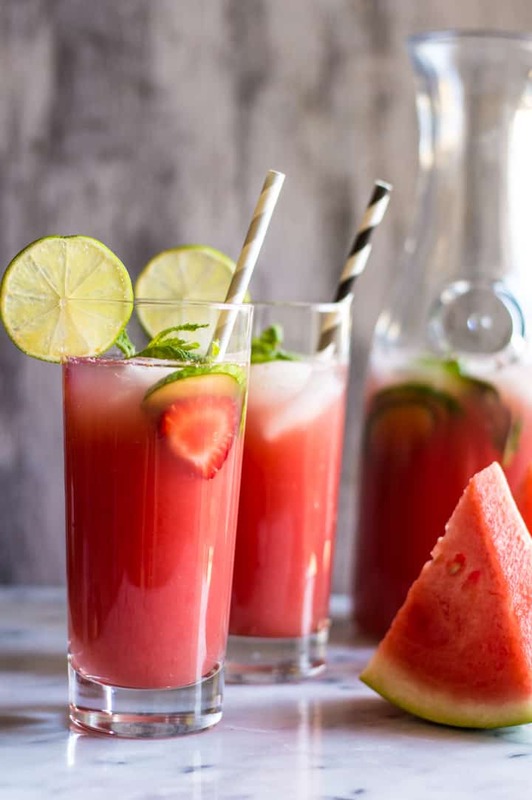 You’re not going to find a single spoonful of sugar in these watermelon strawberry agua frescas. Just nature’s candy. I know kids are already making their way back to school now, but I’m still hanging on to my final days of summer. 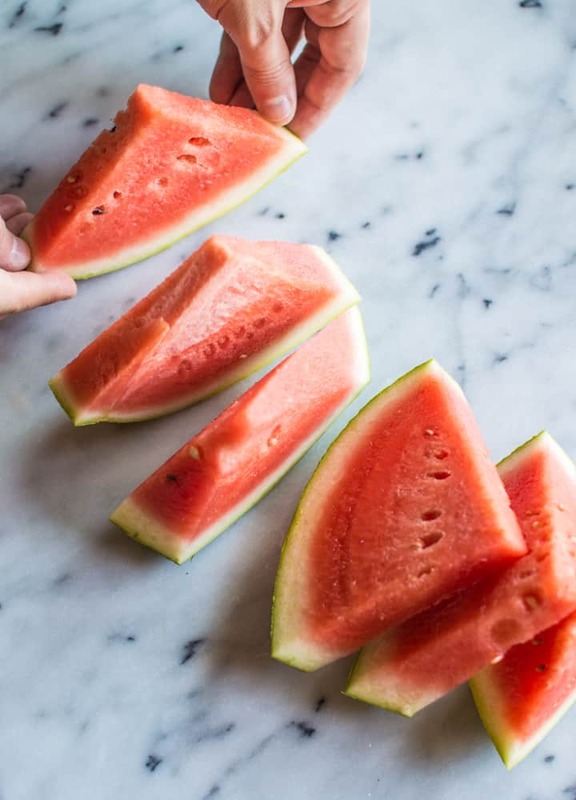 There’s no better way to enjoy the last days of summer than with a load of fresh watermelon and watermelon facials. You mean you don’t massage your face with the watermelon rind like I do? It’s completely awkward but also unbelievably refreshing. 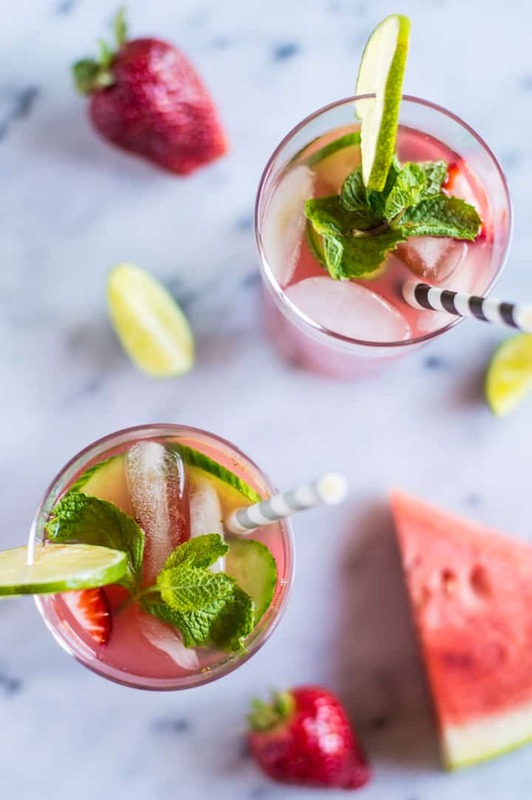 You really only need five ingredients for this recipe: watermelon, strawberries, lime juice, apple cider, and water. The rest is just garnish to make you drinks all fancy. Paper straws are a must, and you get bonus points if you use color-changing straws. Go forth: drink, refresh, and be merry! This recipe serves 4 to 5. You can easily double this recipe to make a larger batch. Blend watermelon, strawberries, lime juice, apple cider, and water until smooth. Taste to see of the sweetness is to your liking. Feel free to add more watermelon or apple cider if you want a sweeter beverage. You can serve the drink immediately or refrigerate it for an hour to let the flavors set. If you are refrigerating it, I like to add some cucumber slices and a few sprigs of mint to the agua fresca to give it more flavor. Serve agua frescas with ice and garnish with lime slices, cucumber slices, and mint leaves. Goodness, this looks so beautiful and refreshing! I can’t get enough watermelon these days! I will have to try this soon. Wow – does this sound divine. I often puree and strain watermelon juice for my daughter (and for my margaritas) but totally want to try this combo! Thanks, Deanna! It was great meeting you in Lodi, and I hope you had a safe trip back to the East Coast! See you in a few weeks! Sounds like the perfect weekend trip! All my favorite activities! Have fun and I love this drink – and love that yellow background! Yea, girl! Oh, and the yellow background is just poster cards! I’m having so much fun with them right now. I was a Minute-Maid Pink Lemonade kid- so I totally understand the Hawaiian Punch lovefest. This agua fresca looks and sounds like summer in a glass. It’s just what I need in the heat of summer! Have fun in Colorado! Thanks, Sydney! Um, I was obsessed with that Pink Lemonade as well, though I usually drank it from the can. Isn’t if funny how our tastes change? Thanks, Regan! Can’t wait to meet you in a few weeks! Thanks, Traci! And oh boy, the transition from vacation back to work is the worst! I just want to sit around and have people cook for me all day! I stay away from sugary drinks now also, so I am all kinds of glad that there is a watermelon sitting on my counter! I see fun refreshing bevs in my very near future. Yes! I bought two more watermelons today. Guess I need to action those into some drink soon! Wow Lisa! 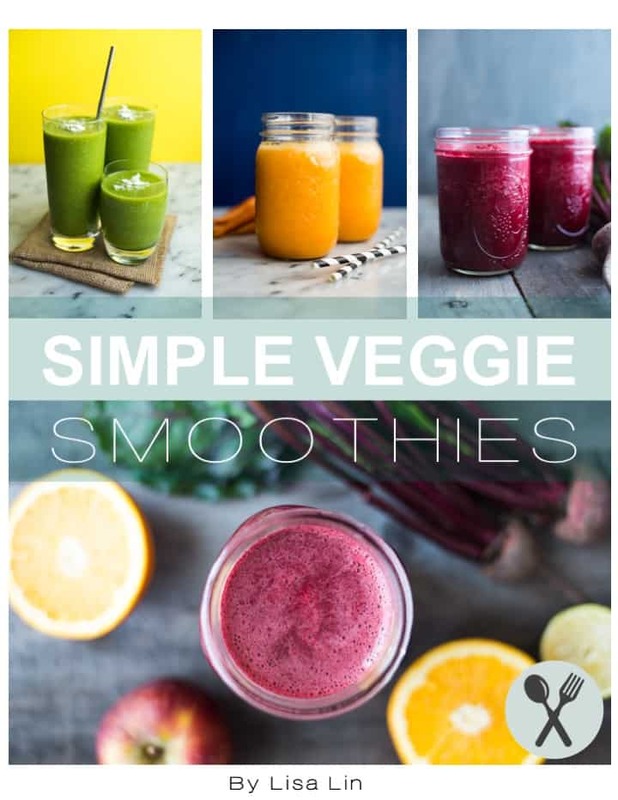 These look wonderful and super refreshing! Perfect for summertime! Gorgeous! 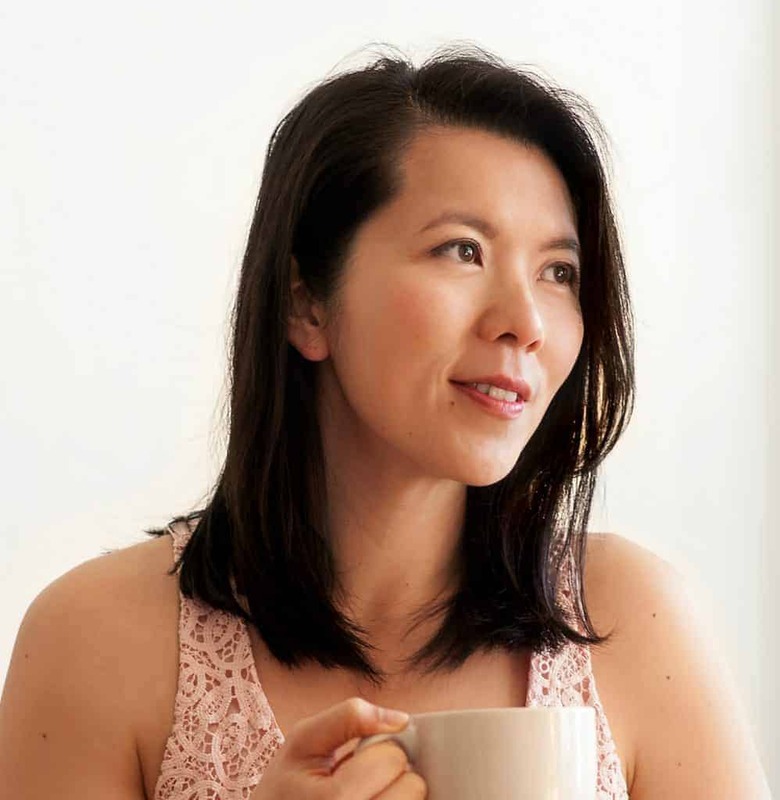 I love how you sweetened this with cider–it sounds so delicious. Pinned! Glad to know I’m not alone in the finger dipping into sugary powdered beverages! I did the same thing with kool-aid as a kid! This is absolutely gorgeous and a must-make. I can’t get enough watermelon! Oh yes, how can I forget about those kool-aid jugs?? Thanks, Jessica! Your photos! Oh my gosh! They totally drew me in and then I saw the pop of YELLOW!! Do you have a yellow background or did you photoshop that?! Beth, thank you so much!! The yellow comes from the poster paper I got from a craft store! It looks amazing! What a gorgeous bright color. 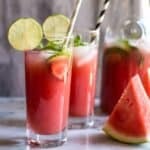 🙂 Watermelon agua fresca is one of my favorite healthy summer drinks, I love your recipe cause it’s sugar-free and also has apple cider vinegar, what a great idea! Thanks, Gemma! Oh, and I’m sorry for causing confusion – the agua fresca actually uses apple cider and not apple cider vinegar. Just wanted to let you know in case you make this recipe soon!